I just thought I would update on what is happening around the mini-farm. Other than the weird winter-spring-almost summer-like then back to winter weather we have been having there are a few things happening on the mini-farm. Our mini-cow (or most of you would know her as a goat), Hannah has been giving us milk for over 13 months! We finally force-weaned her kid, Esther (more about her in a bit), by taping Hannah’s teat. Hannah didn’t seem to care if she let an full grown kid drink the milk, but I did! 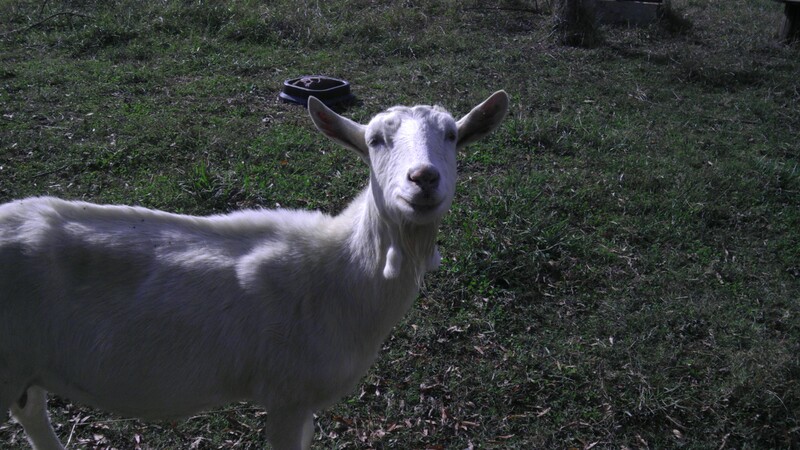 For those of you who are new to my blog, Hannah is a Saanen goat. When she had her kids we realized that something was wrong with half of her udder and no milk would come out. So I have been milking one side for over a year. I expected her milk production to go down once Esther was weaned. She did slow down to just under a quart a day for almost a week. I thought a quart a day from one side was pretty good especially after a year. Well, over the last week her milk production has been gradually increasing! She is up to a quart and a half again! Awesome goat. But we didn’t breed her this year because of her problem and we think she is kind of old. But no complaints from me. I think she has done great. Esther, who is half saanen and half something else, not sure what, is due to kid in mid-June. I’m hoping she is as good a milker as her mama. Esther is a little bit…slow. I call her retarded. I don’t think she really is, but sometimes I wonder. 🙂 But she is really good natured and sweet. Little Lydia is our La Mancha. She is due to kid at the end of June. She is a sweetie too. Always wagging her tail and coming to see you. I can hardly wait to see her babies. They will be so cute! Cooper, my mini horse, is cute and sweet, and mischievous. We call her a brat. She likes to think up new games to play. Her latest game was “You can’t catch me!” In this game she would run away whenever I got close so I couldn’t catch her. I soon outwitted her with that game by giving her treats. She hasn’t played again lately. One new thing I discovered was that she likes to eat eggs. When our hens lay their eggs in the hay shed in the pasture she will eat them. I have to remember to collect the eggs before letting her out, or I have a mini horse with yellow lips! The newest additions to the mini farm our our mini chickens, or I guess you could call them chicks. We got three Barred Rock, and three Black Australorps. They are growing so fast, but not fast enough according to my youngest daughter who takes care of them. Everyday she says how happy she will be when they can go outside with the other chickens. Christian romance author Norma Downing has been writing for years. She writes both contemporary and historical. She currently has a contract with CrossLink Publishing for her first novel, A Promise Made, set in Kansas in 1899. This entry was posted in chickens, farm, goat, goats, horse, miniature horse and tagged animals, Chicken, chickens, farm, Goat, goats, horse, La Mancha, Milk, miniature horse. Bookmark the permalink.